Mission: Keep zucchini interesting. 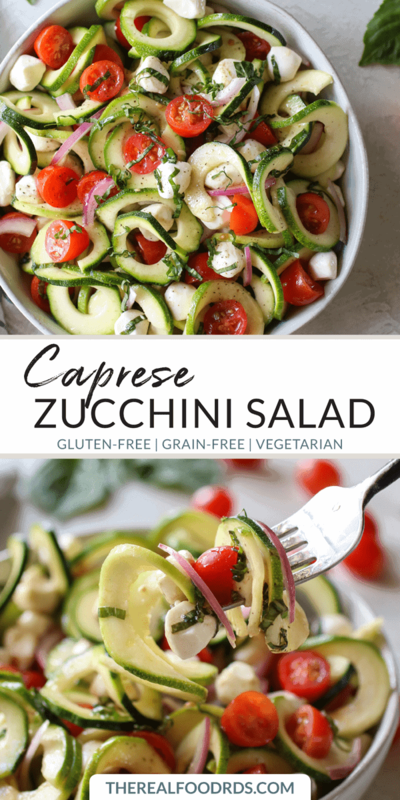 Caprese Zucchini Salad will do just that & more! It’s tossed in a balsamic vinaigrette along with creamy mozzarella, juicy tomatoes & fresh basil. This recipe is sponsored by our friends at Tessemae’s! 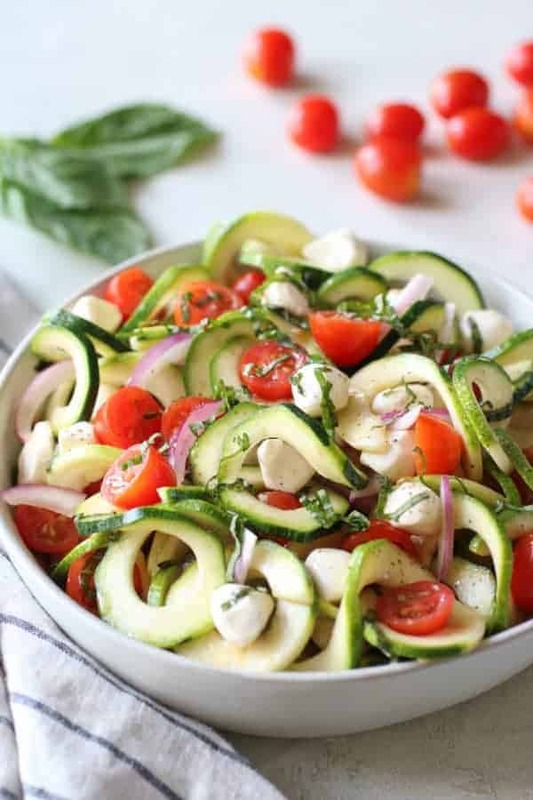 When gardens give you zucchini, you make all.the.zucchini recipes! And…sometimes you get tired of all.the.zucchini! That’s exactly why I’ve set out on a mission to keep zucchini interesting this year. And really, there’s no reason we should get bored of it. By doing a quick search on Pinterest, you’ll find that it’s possibly the most versatile vegetable in existence. 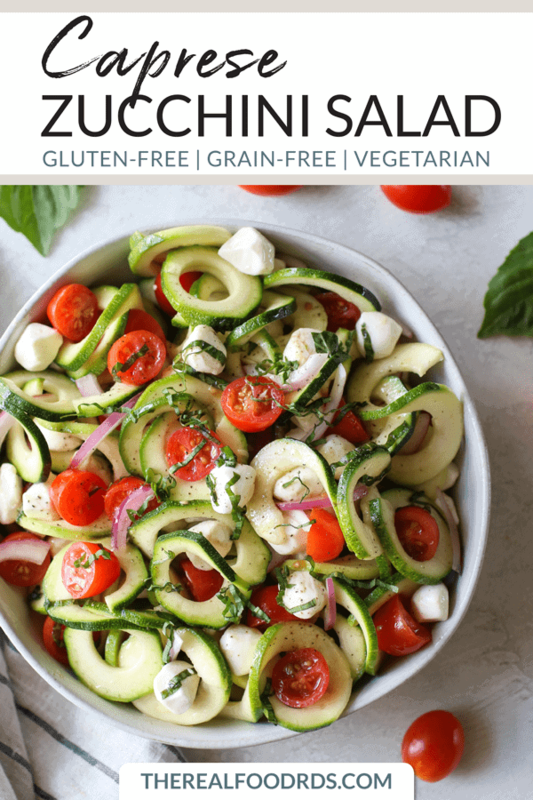 Today, I’m sharing an incredibly easy and fresh Caprese Zucchini Salad recipe with you. I’m a sucker for caprese. I mean, you really can’t go wrong with the combination of creamy mozzarella, fresh basil, perfectly ripe tomatoes and a delicious balsamic vinaigrette. 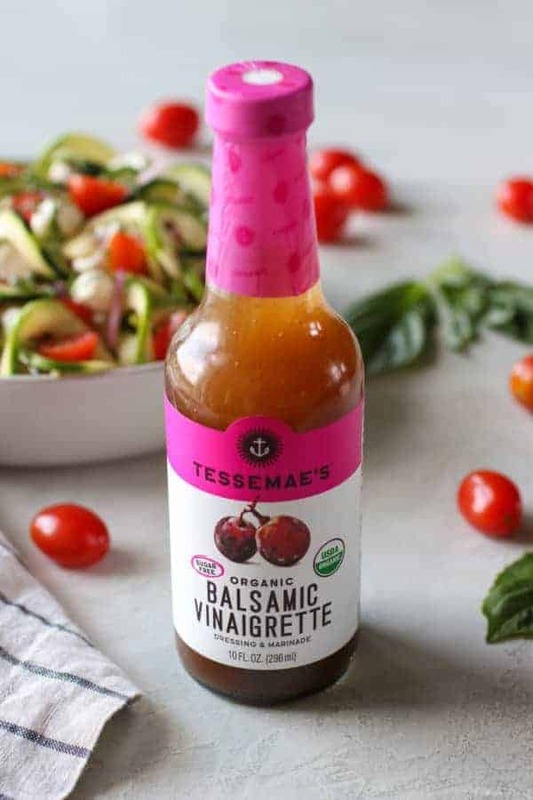 Speaking of balsamic vinaigrette, in this recipe I used Tessemae’s Balsamic Vinaigrette. 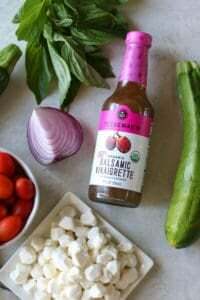 I love the light flavor it provides, the organic ingredients and how it can be used as a dressing as well as a marinade. Versatility is my jam! Fast, fresh and fiercely flavorful! 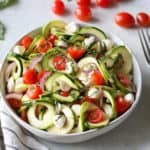 Caprese Zucchini Salad is really quite easy to make. 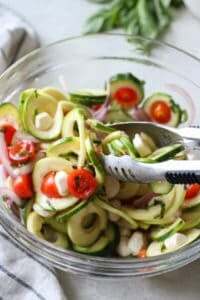 A little chopping, spiralizing (or slicing), tossing and marinating, and you’ve got yourself a healthy and fresh salad to add to the table or potluck. Both Jess and I own an Inspiralizer that fulfills all of our spiralizing needs. 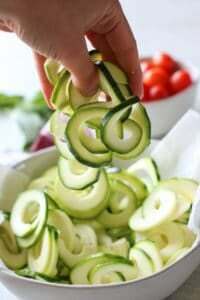 However, no sweat if you don’t own a spiralizer, simply slice the zucchini into thin, half-moons instead. 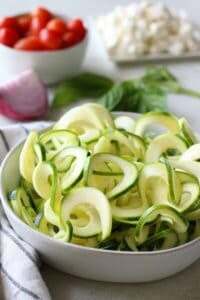 If you’re looking for convenience, many grocery stores (even ones in my rural location), carry pre-spiralized zucchini. 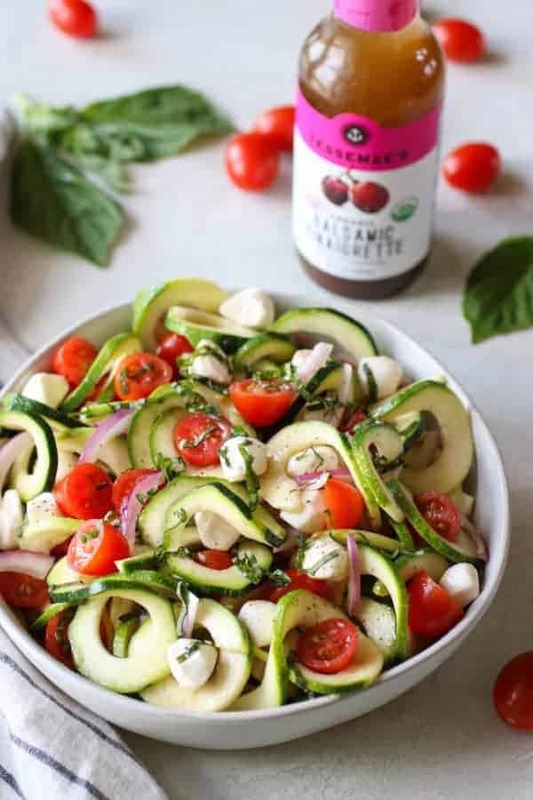 Caprese Zucchini Salad is tossed in Tessemae’s Balsamic Vinaigrette. We took a classic and made it our own. By using the highest-quality ingredients including Balsamic of Modena, we present to the world the greatest Balsamic ever made by hand. Interested in giving Tessemae’s a try? You can place an order of a 4-pack or 6-pack here. Unsure of what to order? Here are my faves: Creamy Ranch, Balsamic Vinaigrette, Lemon Garlic, Creamy Caesar, Buffalo Sauce, BBQ Sauce. Fresh mozzarella makes me happy, but if dairy isn’t your thing, you’ve got options. With that said, at The Real Food Dietitians, our goal is to share a little something for everyone. So if you’re one to avoid dairy, whether it’s due to an intolerance, allergy, experimental (similar to my situation) or you live a vegan lifestyle, we’ve got your back. Simply sub the mozzarella for Kite Hill dairy-free cheese or chunks of avocado. Both will add that creamy deliciousness similar to the texture of fresh mozzarella. 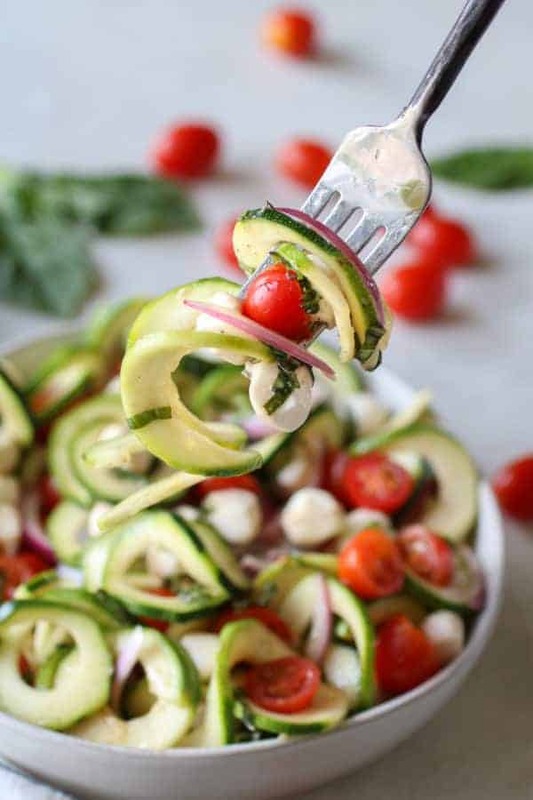 Get that fork ready for twirling – it’s time to give this Caprese Zucchini Salad a try! 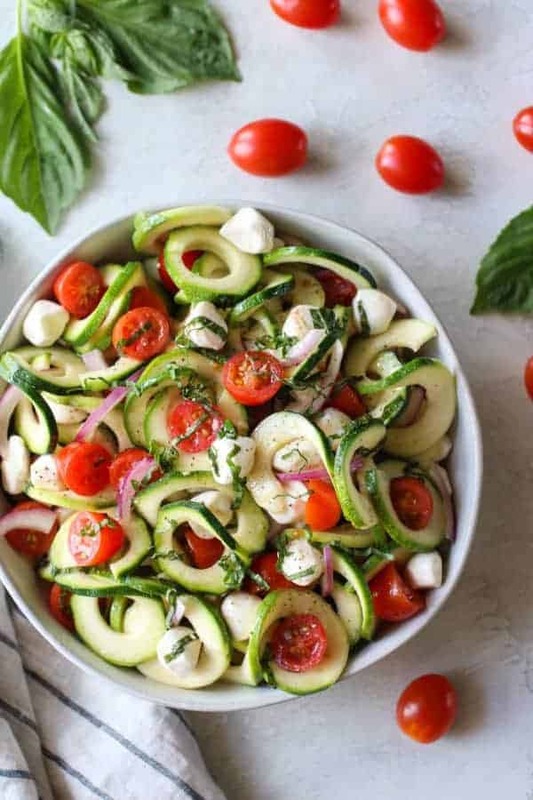 Can’t get enough zucchini recipes? Give our Spicy-Asian Zucchini Noodles, Grain-Free Double Chocolate Muffins, Zucchini Turkey Meatballs, Zucchini Fritters, and Italian-Sausage Stuffed Zucchini Boats a try! Gather all of the ingredients and prepare veggies. 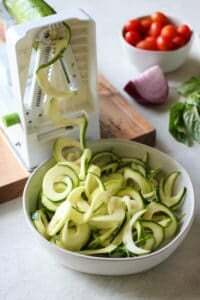 For the spiralized or sliced zucchini, pat dry with paper towels to absorb as much liquid as possible. Next, combine all of the ingredients in a large bowl. 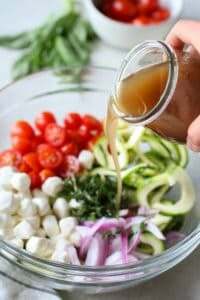 Toss with the dressing. Allow to marinate for 30 minutes in the fridge before serving. Toss and add salt & pepper to taste. Top with additional fresh basil and a pinch or two of black pepper. 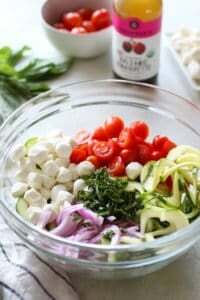 Storing: To store this salad, place leftovers in an airtight container in the fridge for up to 4 days. Prep: This salad holds together well. You may prepare it the day before it’s on your menu.